Most owls are nocturnal predators, with hooked bills and needle-sharp talons. They have wide wings, light bodies, and feathers specially designed to allow them to silently swoop down on prey. Depending on the species, owl calls are characterized as being either a hoot, a screech, or a whistle. Eleven species of owls live in or visit Maine for all or a portion of the year. The great horned owl (Bubo virginianus) and the barred owl (Strix varia) are the most widely distributed owls in the state. These two species live in a wide variety of forested habitats and occupy dense forests, open woodlands, clear-cuts, and even urban environments such as golf courses, cemeteries, and parks with adjacent woodlots. The following section focuses on the great horned owl because it is the species that is often seen and heard. 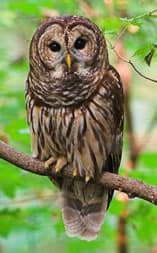 However, except where noted, information about this species applies to most of the other owls, including the barred owl. Great horned owls primarily eat small mammals such as rabbits, skunks and rodents. They also eat various birds, including songbirds, ducks and even wild turkeys. To a much lesser extent, they eat reptiles, amphibians, fish and insects. Owls have keen hearing and vision, particularly in low light conditions. Both adaptations are for hunting at night. Since their eyes do not move in their sockets, they have very flexible heads; they can rotate their heads as much as 270 degrees. Great horned owls are Maine's earliest-nesting bird. Pairs form from mid-January to mid-March, depending on the north-south location in the state. The male owl chooses a nest site and attempts to attract a female by frequent hooting. The female incubates one to three eggs for 28 to 35 days. The male provides her food and guards the nest and young. The young remain in the nest for about six weeks, then climb out onto nearby branches. They begin taking short flights at seven weeks of age. They can fly at nine to ten weeks of age. Both parents feed and tend the young for several months, often as late as September. Great horned owl nests are usually located high in tall trees, generally in the crotch of a branch next to the trunk. Where suitable nest trees do not exist, owls will use rock ledges, power-line towers, hay lofts and nest platforms. Great horned owls make little if any effort to construct an elaborate nest or even repair an existing one. Rather, they customarily usurp a nest that a red-tailed hawk, crow, great blue heron, or other large bird made the previous year. An owl seldom uses the same nest more than once, because trampling by the young usually reduces the nest to a disintegrating mass of sticks. Adult great horned owls may be killed or seriously injured when feeding on road-killed animals or attacking prey. These owls have been found, for instance, riddled with porcupine quills or reeking of skunk scent. About fifty percent of the young that leave the nest die within the first year from starvation, vehicle collisions, or various other causes. The oldest banded great horned owl recovered in the wild was 13 years old. Captive birds can live nearly 30 years. Eleven species can be seen or heard around wooded rural properties, agricultural areas, and large urban parks, although some are more common than others. (Bubo virginianus) occurs throughout Maine and is easily identified by its large ear-tufts or "horns." It's also called the cat owl because the tufts look like cat ears. This owl stands 20 inches tall and has a 48-inch wingspan. It is dark brown with black spots above; the underparts are pale brown with heavy, dark brown bars. Some subspecies are paler. All have large yellow eyes. Great horned owls can turn their heads 270 degrees either way when facing forward, but they cannot turn their heads 360 degrees. (Strix varia) is a bit smaller and is the only Maine owl with dark brown eyes, a thicker appearing neck, and no ear-tufts. The neck and back are barred crosswise; the belly is barred lengthwise. It prefers swamps adjacent to wet, open meadows for foraging. (Tyto alba) is rare in this state. It can be identified by its white, heart-shaped face, lack of ear-tufts, dark eyes, and golden-buff plumage with ghostly light underparts. It has a 39-inch wingspan, and its long legs give it a height of up to 20 inches. The barn owl favors rodents as prey and earned its name by readily nesting in barns, silos and sheds. The barn owl has been confirmed only in very small numbers in the very southern part of York County. (Otus asio) is small, only 10 inches high with a 20-inch wingspan. Adults are dark brown or gray with small ear-tufts. This species is a permanent resident in most of southern Maine. It nests in tree cavities – including old woodpecker holes – but will also use nest boxes. Screech owls favor areas near water. They eat rodents, small birds, large insects, and the occasional fish, crayfish or amphibian. (Aegolius acadicus) is even smaller – eight inches tall with an 18-inch wingspan. It has dark brown plumage, brown and white vertical breast streaks, and no ear-tufts. Thousands of this seemingly tame, fearless little owl migrate from Canada south through Maine to points south in winter, but some reside in the state throughout the year. Like the screech owl, it nests in tree cavities and will use a nest box. It prefers dense coniferous and broad-leaved forests next to water. It eats small mammals, including shrews and mice, and will also catch small birds and bats. (Nyctea scandiaca) is an infrequent winter visitor from Quebec and Labrador except for "flight years" when they appear in higher numbers. Periodic crashes in lemming population cause the birds to move south in search of prey. This bird is unmistakable: It stands up to two feet tall and has snowy white plumage. It is seen primarily during daylight hours on the ground at open areas along the coast, open inland meadows and airports. (Surnia ulula) is a rare winter visitor to northernmost Maine from southern Canada. Primarily seen during daylight hours, it usually perches at the top of prominent trees in forests with openings or adjacent to open habitats for foraging. (Strix nebulosa) is a rare and irregular visitor to Maine. When it does appear, it is most likely to be seen in large, open wet areas bordered by woodlands. It is a large and impressive owl. (Asio otus) can generally be found in coastal Maine, but is considered a rare and local breeder. It prefers dense coniferous or mixed forests adjacent to open habitat for foraging. It is a quiet bird, making it difficult to observe when active nocturnally. When it does vocalize, it produces doglike barks and yelps, catlike meows, and shrieks, cackles and whistles. (Asio flammeus) is found primarily in the northern and eastern portions of the state, preferring extensive open marshes or grasslands. They are active day and night, hunting rodents by flying low over open ground. (Aegolius funereus) winters in the northern two thirds of the state in dense coniferous and mixed hardwood forests or woodlots. It is considered a rare and irregular visitor from Quebec and the Maritimes. Because most owls spend their day roosting high in trees, inside tree cavities or in nest boxes, you are more likely to hear an owl than see it. At night, if you remain quiet, you can sometimes locate a calling owl with your flashlight; do not, however, disturb an owl during its late winter to spring nesting season, a critical time in its yearly cycle. You might also spot an owl when crows, jays, or other birds discover them in their territory. These smaller birds will defend their domain by diving and calling repeatedly at the perched or flying owl, and activity called mobbing. Look and listen for this behavior and see if you can locate the "invader." Owls roost in places that offer maximum concealment during daylight hours, choosing trees with dense foliage. They favor conifers, but in deciduous forests they will use trees that hold clusters of dead leaves over winter. During the day, scan tall trees for the silhouette of an owl. Also, look for the whitewash of droppings on branches and rocks, and owl pellets on the ground. At dusk or at night, look or listen for an owl roosting in the area. Typically, owls ingest their entire prey, including feathers, fur, teeth and bones. The undigested material is bundled into compact pellets and later regurgitated. Pellets are usually found under or near the owl's favorite roost. Pellets range from one half inch to four inches long, depending on the owl's size and its diet. Pellets, shiny and black when new, turn gray with age. Owl droppings are semi-liquid and primarily white; a whitewash can sometimes be seen under a nest or roost site. 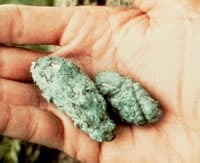 What's in an Owl Pellet? An owl pellet is a clod of fur or feathers and bone – the indigestible remains of the animals an owl has eaten. Because owls swallow small prey whole and are able to digest only the fleshy parts, they regurgitate the remaining solid material as a compact pellet or casting. When owls feed on insects, each regurgitated pellet contains the indigestible parts of the exoskeletons of numerous individual insects. Because owl pellets accumulate in predictable locations, they are readily available for collection and examination. Although birds of many species regurgitate pellets, pellets from large owl species are especially suited for study because they are big enough to be examined without a microscope and they contain the entire skeletons of small animals the owl has eaten. Pellets of other raptors, such as eagles and hawks, are less useful because these birds tear much of the flesh from their victims and do not swallow bones. Pellets last a long time in dry climates and in the protection of barns or other buildings. The owl regurgitates a pellet after a night of foraging, so you will almost always find the remains of at least two entire skeletons in each pellet. If you soak one in warm water, dissect it carefully, and examine the bones, teeth and other remains under magnification, you may be able to identify the prey species. You can sort the bones (skull, jaw, ribs, pelvis, appendages, perhaps even vertebrae if you are meticulous) and place them in approximate anatomical order. Enjoy, and remember to wash your hands when you have finished. Look for the stick nests that great horned owls take over from large birds or squirrels. These nests are easy to spot in deciduous trees, which remain bare during the owl's nesting season. Owl use different calls for different purposes; these calls may be associated with territorial behavior, courtship, or begging by the young. For each call, an associated string of words is given to make it easier to remember. (If the call does not sound like those words to you, then make up your own association.) 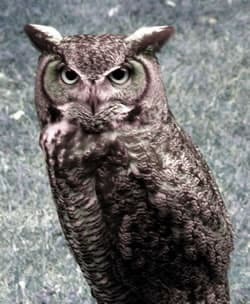 You can visit www.eNature.com to hear owl and other bird calls. Great horned owl: A series of four or five deep, resonant hoots given in various rhythms by different individuals: hoo-hoo-hoo; hoo-hoo ("Who's a-wake, me too!"). Calls are heard most in the early evening or predawn hours. The male gives them in all seasons, but more commonly in fall and winter as he advertises and defends his territory. The call may be answered in an unhurried way by another owl. Juvenile great horned owls beg with a high, scratchy reeeek well into the summer. Occasionally two or more owls can be heard hooting, seeming to respond to one another. This is probably territorial hooting between males, since females are silent except for the few weeks of courtship. Northern saw-whet owl: Low, whistled toots (about two per second): toit toit toi or poo poo poo. Also a wheezy, rising, catlike screech: shweeee. Barn owl: A long hissing or raspy scream, cssssshhH, which sounds similar to canvas being ripped. The call is similar to, but usually longer and more raspy, than the call for food made by juvenile great horned owls. Retain multi-acre patches of coniferous and/or deciduous trees. Protect quiet, secluded areas near rivers, swamps, and lakes and away from human activity. Retain large dead or dying trees that are twenty or more feet tall that owls can use as perch sites. Protect or plant hedgerows and thickets to attract small mammals that owls eat. Leave large grasslands alone or mow them only annually to provide habitat for these small mammals. Poison bait has the potential to kill owls, so manage mice and rat problems other ways. Install owl nest boxes for barred owls. 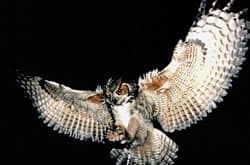 Because of their wide-ranging diet that includes rabbits, squirrels, chipmunks and songbirds – and occasionally small domesticated animals – great horned owls elicit mixed emotions in people, even wildlife-lovers. You can employ several strategies to prevent conflicts, but remember that under federal and state law it is illegal for anyone to injure, harass, kill, or possess a bird of prey. Enclose domestic animals: Free-roaming chickens, ducks, turkeys, pigeons, small domestic rabbits, and similar animals are susceptible to owl predation. Although rare, there have been reports of great horned owls preying on small dogs and cats. By far the best defense is to house domestic birds in a durable, fenced enclosure that will allow the birds to safely eat and loaf outside during the day. Such a structure can be constructed with a wooden framework that is entirely covered with one-inch poultry wire or similar netting. This outdoor run can be permanent and attached to a coop or other building, or be portable and moved periodically. Where a complete and permanent enclosure isn't practical or desirable, provide escape cover. Birds have natural defenses; at the sight of an owl, they will quickly squeeze under a nearby building, old car, shrub, or other area. You can construct escape cover by placing planks, plywood, or chicken wire placed over logs, rocks, or bricks. This outdoor area should be at least seven by seven feet and the cover should be a foot off the ground. The occasional loss of a free-range bird is to be expected; it is difficult to completely protest free-range birds from owls. Change your routine: If they are successful at catching prey, owls will quickly learn the routines on a property. People flying pigeons or allowing other birds to feed unattended should vary their routine if they have had a problem or have seen an owl nearby. Install scare devices: A variety of devices can frighten a problematic owl. Increasing human activity in the area will keep most owls at a distance. Yelling and clapping hands, firing a gun loaded with blanks (it is illegal to shoot any owl), and banging cans together are all effective when an owl is nearby. The "hawk globe" is basically a round mirror designed to scare an attacking hawk or owl. If it is placed in the flight path the owl uses, an attacking bird will see its reflection and retreat, giving domestic birds a second chance. Because owls hunt on their own, they may avoid returning to a place where they perceive competition from another owl. Scare devices reduce losses rather than eliminating them. If you use these devices you must be willing to tolerate occasional losses. If predatory birds are hungry, they quickly get used to, and ignore, frightening devices. Protect yourself from dive-bombing owls: Most aggressive behavior from owls (barred owls and great horned owls are the most often reported) occurs when they are defending their territory, homes, mates or young. During this period in winter, adult birds may engage in belligerent behavior, such as attacking creatures many times their size. When possible, stay away from nesting areas with aggressive birds until the young are flying (three to four weeks after eggs hatch) and the parents are no longer so protective. If you must walk past a nest, wave your arms slowly overhead to keep the birds at a distance and wear a hat (or helmet) or carry an umbrella. Under federal and state law it is illegal for anyone to injure, harass, kill, or possess a bird of prey. Licensed rehabilitators are the only people legally permitted to transport and keep wildlife, including owls. If you find an injured owl, contact a wildlife rehabilitation facility immediately. Your regional wildlife office keeps a list of rehabilitators and can tell you which ones serve your area. Owls are not a significant source of any infectious disease that can be transmitted to humans or domestic animals. A few human Salmonella infections have resulted from handling owl pellets in school settings. Wash your hands after handling owl pellets. Owls are federally protected. Any permit to lethally control these species would need to be issued from the U.S. Fish and Wildlife Service, and would only be issued in very extreme cases. Written by: Paul R. Ehrlich, et al. New York: Simon & Schuster, 1988. New York: Alfred A. Knopf, 1977.